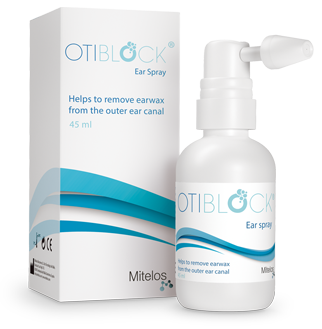 OTIBLOCK® Ear Spray is a product aimed at facilitating cerumen impaction removal based on the cerumenolytic properties of hydrogen peroxide. 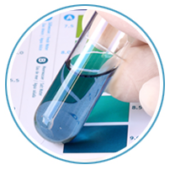 As you know, hydrogen peroxide has proven to be a well established, safe and effective compound by clinical practice and has been endorsed by medical academies. You probably already prescribe it to your patients. Ceruminous glands release peroxidase, a catalase enzyme. When sprayed into the ear canal, the liquid mixes with the earwax and the hydrogen peroxide decomposes into oxygen and water, due to the catalytic action of peroxidase. The resulting oxygen bubbles break earwax down into smaller fragments. constituent of cerumen plugs, and subsequently inducing keratolysis with disintegration of the wax. 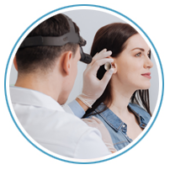 Unlike other otic products, OTIBLOCK® Ear Spray is free from oily compounds and, therefore, does not mix with cerumen to form a sticky paste that blocks the microsuction devices used to remove cerumen impaction. Even more important than that is the fact that OTIBLOCK® Ear Spray has been formulated to respect the physiology of the ear canal. In other words, some ear sprays or drops are too alkaline and, therefore, make the outer ear more prone to bacterial overgrowth and infection. As you know, an alkaline pH is a known risk factor for otitis externa. OTIBLOCK® Ear Spray, meanwhile, has a composition that has been carefully developed to be relatively acidic, in line with normal cerumen physiology. OTIBLOCK® Ear Spray can be self-administered by the patient at home or even used at your practice. Its handy bottle and ergonomic ear adapter allow for convenient, efficient and safe use.